Dubai is the city with a plethora of indescribable man-made structures and is evidently a playground for the Rich & Famous. With fabulous beaches and a host of attractions including the incredible hotels, The Palm and the never ending shopping opportunities. Dubai offers the discerning traveller and their family an unforgettable experience. The glamorous emirate of Dubai is one of the most fascinating cities in the Middle East. With a myriad of hotels, shopping malls, famous attractions and world-class sporting events and facilities, it is one of the world's fastest growing and most popular destinations. Direct flights to Dubai can be found on Royal Brunei, Emirates, BA and Virgin Atlantic. Often a good way to find low cost flights is to travel on one of the many airlines which fly to Dubai with a plane change or short transit in Europe or elsewhere in the Middle East enroute. Dubai offers a variety of accommodation from The Palm, a man-made island that stretches out of the coast in the shape of a palm tree where a number of the luxury hotels can be found such as Atlantis The Palm, to the beach front resorts that stretch for miles along its sandy shores. If you like a bit of retail therapy, there is a great choice of shopping malls and luxury boutiques to browse, also the annual Dubai Shopping Festival has proved to be very popular with some great offers available. Dine in one of the many fantastic restaurants featuring worldwide cuisine. Dubai can also be a fantastic stopover destination for those that are travelling onto Asia and the Far East or even Australasia. There's a great choice of activities to be found in Dubai from riding a camel through the desert to skiing in the world's first desert snow dome and playing golf on one of the many championship courses. For sport lovers, you may be aware of the big championships that Dubai is host to such as the PGA Golf, Powerboat racing, Dubai Rugby 7s and the ATP Dubai Open. 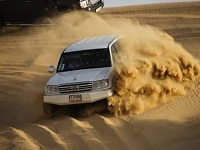 If you prefer to try out some exciting new sports for yourself, there is plenty of opportunity for the adventurous to try their hand at sand skiing or quad biking over the desert sand dunes. Don’t forget one of the must do’s in Dubai is to hire a yacht. Xclusive yachts offer luxury cruises designed to meet your specific requirements at very affordable rates. It’s a fantastic way to experience the beautiful coastal waters of Dubai and see some of Dubai’s stunning landmarks including World Islands, Palm Jumeirah and Jumeirah Beach. As one of the world's most popular destinations, there are some great offers on cheap flights to Dubai, UAE. Give our flight search box a try to find the cheapest flights around as well as some great deals on lastminute flights for a last minute get-away. Dubai has a sub-tropical climate and receives hot weather all year round, especially during the summer months July and August. Some find the hot weather a little hard to endure as it tends to be very dry, therefore the best time to travel is between November and March. It is always advised that you stay hydrated and be aware of sunstroke. Dubai has become increasingly popular with holidaymakers from all over the world. With so much to see and do in Dubai, people will find plenty of excitement to squeeze into a three-day stay. ..